I should be knee high in newspaper, bubble wrap and packing tape but I am already so tired of it that I could cry. I thought I would sneak away for a few and type up a quick post. I really haven’t been cooking or trying out anything new for the blog but I had a few back ups that I hadn’t posted yet. The idea of moving and even attempting to cook is making me quite nervous. There’s only so much fast food you can tolerate and sit down dinners cost an arm and a leg for 6 people. As usual, I am not organised enough to have thought ahead and made a few dishes and stuck them in the freezer. I guess I will be cooking sooner than I want to! This soba noodle bowl comes together in a flash and is a great contender for quick, easy, moving in meal. I made this cold soba noodle bowl a few weeks ago for lunch. The night before it had been pretty cold and I used the soba noodles to make a hot soup per my family’s request. All the same ingredients but the noodles were served in a hot broth and the noodle sauce/dressing was drizzled into the hot broth as a flavouring. It worked great in both cold and hot form. If you’ve never tried soba noodles, they are made out of buck wheat, a grain like seed, and are not related to wheat at all (it is actually related to sorrel and rhubarb). I love how floral soba noodles smell when they are cooked: they have a lovely, delicate fragrance. If you can find soba noodles that do not have wheat flour added, then the soba noodles are gluten free, which I love. Toss the noodles in the dressing and then top with shredded cabbage, cucumbers, red peppers, fresh herbs or pretty much anything you like. The dressing/sauce can be served on the side for anyone who likes to dip their noodles. 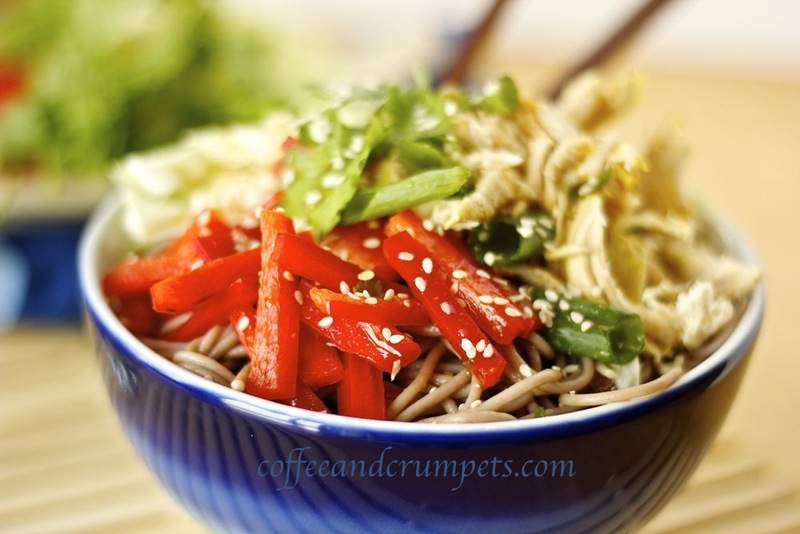 A little drizzle of sesame oil and a sprinkling of sesame seeds and you have a great cold soba noodle bowl salad. These soba noodles are the perfect accompaniment to a Memorial Day cookout, especially if you have Asian inspired meat on the grill. They do double duty as a side dish and a cold salad. You can very easily leave off the shredded chicken or replace it with fried tofu and it is perfect for vegetarians. Boil the soba noodles per package instructions. Once cooked, drain and rinse the noodles in cold water and set aside. Toss with a little sesame oil if they stick. To make the dressing, put all the dressing ingredients into a blender and blend into a puree. Check the dressing to see if its sweet enough, or tart enough; however you like it. Also check for spiciness and adjust by adding more. Toss the noodles in the dressing (there will be enough for the 1Lb of noodles..6 bowls). If more dressing is required, the recipe can be doubled. Put the dressed noodles into a bowl and top with the cabbage, chicken, peppers and cucumbers. Drizzle a little sesame oil and sprinkle the sesame seeds. Double the dressing recipe if you want to offer some as a dipping sauce. Adjust the sugar, lime juice and hot sauce to your liking. This sauce was great drizzled into hot noodles in chicken broth, added really nice flavour and a bit of heat to the broth. There is no rest for the wicked and so I must get back to my wrapping, packing and stacking. We are beginning to move our little stuff in today and so there’s going to be lot of back and forth this weekend. Good thing the new house is 5 minutes down the road! I wanted to thank you all for your wonderful comments and words of encouragement. It is pretty amazing to have such great friends who know exactly what I am going through and say the right things to help and support. Thank you so much! Have a great weekend and a very Happy Memorial Day! Thanks Amy! I really like soba noodles too. Hey Nazneen, hope all going well with your move. You know, I am totally in your shoes. But if you are going to cook stuff that looks so delicious despite a transition, I don’t mind. I complained a lot while packing but realised that unpacking was the more difficult one. Hope you settle down soon…take your time my friend! The soba noodles look and sound fantastic! Delicious, delicious ! I hope everything is going well with the move and you’re settled into your new place. Delicious, delicious ! I hope everything is going well with the move and you’re settled into the new place. Soba is my favorite noodle + veggies AND sriracha…win!! I hear yah! At one point, we moved 5 times in 6 years! Go figure! Totally understandable that you were not able to precook! Who has the time, really? Good luck with the move…it will be over soon and back to normal! I’m glad the new place is only 5 minutes away – it makes things easier. Not easy, of course, but a bit better! Great dish – tasty and fast. I’d make this even when I didn’t need to get put together a meal quickly. Good stuff – thanks. Moving? Let it be over soon and the day will come when you actually laugh about ALL the things which ostensibly went wrong!! Meanwhile, hour by hour! Love buckwheat, love soba noodles: this is such a fun, flexible recipe that I must really go find my soba noodle package in the pantry 🙂 ! Hi Eha! I hope so! It really is not fun though, I guess it would be ok if I was moving into a house of my own but we don’t want to buy quite yet. It’ll be ok I’m sure 🙂 Hope you try the noodles, they were yummy! I didn’t know you are moving but anyway good luck with unpacking. It gets tiresome first you pack then unpack and set everything at place. Soba noodles look lovely compared to rice noodles. I never thought of buying because I do not like the taste of buck wheat flour. I think I should try this I like everything going in it… love raw cabbage in noodles. Thank you Balvinder! Please send me happy thoughts and I’ll be ok! Gorgeous bowl of noodles, and looks so beautiful that I want to eat it off my screen. Good luck with the packing, I know how back breaking a job it is. I hear u about eating out…..though these are the times when Dimsum and Chinese Buffet look good. Thanks Minnie! They were pretty good. I am bored of packing and unpacking…what a tedious chore. Love soba noodle. Love the versatility of how this can be served hot and cold. I hope you get to rest in between the packing and unpacking. Thanks Lail. Yes, I liked how I had it hot one day and cold the next. Packing is going and I’m trying not to get too tired. You have everything yummy going on in this bowl of noodles! Delish!